When was Gunpowder invented? Historians tend to agree that Gunpowder was invented c. 1044 AD and the first known use of Gunpowder in warfare was during the Middle Ages of invention. Who invented Gunpowder? The name of a specific person has never been credited with the invention of Gunpowder, but it was invented following the invention of Fireworks by Li Tian in c. 650 AD during the Tang Dynasty. The name of the inventor has been lost over time, although the first use of Gunpowder is believed to have originated in Ancient China. The invention of Gunpowder was a far-reaching advancement to the field of warfare and weapons. Definition of Gunpowder: Gunpowder is defined as a mixture of potassium nitrate, charcoal, and sulfur in a 75:15:10 ratio which is used in gunnery, time fuses, and fireworks. Gunpowder contains the necessary amount of oxygen for its own combustion. Fact 1: When was Gunpowder invented? The name of the inventor of Gunpowder is unknown but it is believed to have been invented c. 1044 AD during the early Middle Ages. Fact 2: Who invented Gunpowder? Prior to the invention of Gunpowder in China, a Byzantine engineer called Callinicus invented the deadly weapon known as 'Greek Fire' in the 7th century. The formula for producing Greek Fire was a closely guarded secret but consisted of Saltpeter, Sulphur, Quicklime, Bitumen, Resin and Pitch. This terrifying fiery substance was used was first used against the Arabs at the siege of Constantinople of 673. The substance that produced 'Greek Fire' wrought horrifying death and destruction. It stuck like glue and was nearly impossible to extinguish except with sand or salt. Throwing water on Greek Fire only fanned the flames. Fact 2: Who invented Gunpowder? Greek Fire was unknown to the Chinese but before the invention of Gunpowder in China c. 1044 AD, firecrackers had been invented by accident which led to the invention of Fireworks by Li Tian in c. 650 AD. Fact 3: Who invented Gunpowder? Firecrackers Firecrackers were invented in China when green bamboo shoots, being used for fuel, were thrown on to a fire. The bamboo suddenly made a loud, startling, popping noise and 'firecrackers' were invented. The Chinese word for 'firecracker' is 'baozhu' meaning "exploding bamboo". Fact 4: Who invented Gunpowder? Fireworks: A Chinese monk named Li Tian invented fireworks c. 650 AD by placing a mixture of honey, sulfur and saltpetre (potassium nitrate) into a bamboo reed. The mixture of molten sulfur and honey acted as fuels were oxidised by the oxygen released from the potassium nitrate causing what is now known as an ‘exothermic chemical reaction’ that releases energy by light or heat. The fireworks were a great success and used in religious ceremonies and Chinese celebrations. 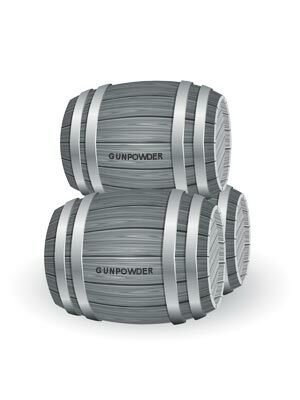 Fact 5: Who invented Gunpowder? The Chinese invention of Gunpowder occurred when a third ingredient was added to the firework concoction. The third ingredient was charcoal, which created the famous black powder, of what would become known as gunpowder. The formula for gunpowder, of charcoal (carbon), sulfur and saltpetre (potassium nitrate), was kept a closely guarded secret for many years. Fact 6: Who invented Gunpowder? The Chinese name for Gunpowder was 'huo yao' derived from the words 'huo' meaning "fire" and 'yao' meaning "medicine". The secret recipe for huo yao changed over the years and other substances such as arsenic were added. Fact 7: Who invented Gunpowder? The Chinese alchemists began to use the black powder as a flammable substance in Chinese warfare and weaponry. Bamboo firecrackers and fireworks had already been used attached to regular arrows as fire arrows but the invention of the black powder revolutionized ancient weapons into powerful explosives in the form of crude rockets and grenades. Fact 8: Who invented Gunpowder? Toxic smoke incendiaries containing arsenic and lead, mixed with the black powder were also launched from catapults. Fact 9: Who invented Gunpowder? Marco Polo (1254 - 1324) brought the idea of fireworks and gunpowder to the Western world, following his famous travels in China. European alchemists then began to create their own formulas for the deadly explosive. Fact 10: Who invented Gunpowder? The famous Franciscan friar and alchemist Roger Bacon (c. 1219 – c. 1292) described the explosion of Black Powder in 'Opus Majus' in 1267 and was the first European to record its formula. However, guns were not invented until after Bacon’s death so he never used the term ‘gunpowder’. Fact 11: Who invented Gunpowder? The invention of the 'gunne' was made in the mid 14th century and described as "an engine of war that throws rocks, arrows or other missiles from a tube by the force of explosive powder". Gunpowder was commonly used as a missile launched from trebuchets and cannon were also known in Europe by that time and were used in the defence of Medieval castles. Fact 12: Who invented Gunpowder? The first recorded use of a firearm, or gun, was in 1364. The word 'Gun' derives from the Old Norse word 'gunnr' meaning "battle." The earliest guns were fired by holding a burning wick to a "touch hole" in the barrel igniting the black powder inside. By the early 15th century the black powder was referred to as Gunpowder. Fact 13: Who invented Gunpowder? The invention of Gunpowder led to the evolution of the gun, first used as hand guns. Matcklocks were developed in 1400 improving the reloading mechanism. Rifles first appeared c1500 and the Wheellock was quickly invented that improved the firing mechanism. Flintlocks were invented in 1630. Automatic guns were developed and the Gatling gun was invented in 1862 and automatic rifles followed. Fact 15: Who invented Gunpowder? Gunpowder was used for blasting, for building and construction, in mining industries, as a military explosive and in weapons. Fact 14: Who invented Gunpowder? Gunpowder was the only explosive in common use until the middle of the 19th century when it was superseded by nitroglycerine-based explosives. This new type of explosive was pioneered by Alfred Nobel (1833 - 1896) who invented Dynamite in 1867. The explosive properties of TNT (Trinitrotoluene) were discovered by German chemist, Carl Haussermann in 1891. The use of Gunpowder in gun cartridges was replaced by smokeless powder. Fact 16: Who invented Gunpowder? Gunpowder is still used today to add explosions or smoke to fireworks and to produce special effects in movies, TV and stage productions.